There are two paradigm challenging forces at play in marketing today. One is obvious – the shift to digital and social media. The other is somewhat less widely known but no less significant, being the new understanding of consumer psychology offered by behavioural science and neuroscience. What isn’t recognised is that the frameworks they suggest for marketing are fundamentally different. The resolution of these opposite views may well be pivotal in shaping the future of consumer marketing. Pity the senior marketer today. It seems like not a day goes by without news of a new tech widget that will be ‘essential’ for marketing success. Or another layer being added to the complexity of how to really make digital and social media work. (Think the ubiquitous ‘How to’ guides for every conceivable micro-component of the digital landscape). Life used to be ‘easy’. There was the 4Ps and a handful of channels to master. Typically once a marketer had figured out how to develop and launch a product, and to get a decent television campaign off the ground, life would settle into a comfortable rhythm. Now there are dozens of channels and just as many ways to use them depending on exactly why, when and where they’re connecting with people. Consumers don’t want to be interrupted anymore, they want to be invited and participative (at least in theory). They’re certainly more cynical and demanding of brands. Add to this the escalating demands of retailers if you’re a manufacturer, or the challenges of omni-channel retailing if you’re a retailer, and it’s not hard see why marketers are losing sleep. The structure that wraps all this up is the now digitally enabled consumer journey. 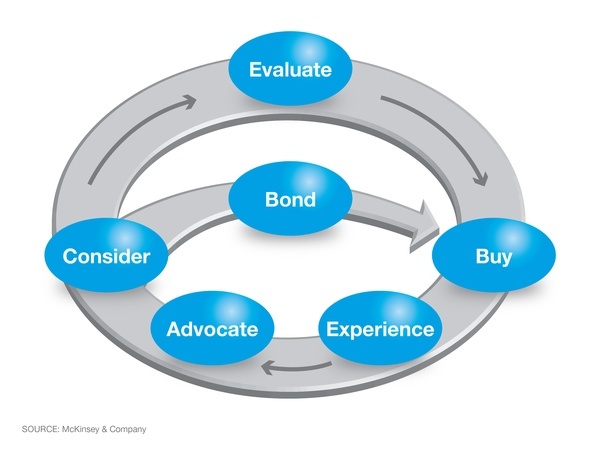 Rather than the neat progression of the traditional marketing funnel from awareness through to consideration and eventually loyalty (if this was ever really the case), a process of loops within loops – with consumers starting and navigating their decision making at different points and with different combinations of steps – is now envisaged. We see people weaving their way through multiple platforms and channels in pursuit of just the right product or deal, with this increasingly involving smartphones and being about the context of communications. Marketing in this world is about delivering the right facts, figures and advice whenever and wherever the consumer demands them. The marketer’s armoury here consists of such things as searchable product information, product and price comparisons, help guides, interactive tools, personalised suggestions, time and location based offers, and so on. It’s not hard to see that the assumption underpinning all this is that of a highly considered decision making process. Enabled by the ease of shiny new digital possibilities, this view has us all researching, evaluating and generally thinking about all our purchase choices with a new level of interest and rigour. Not just for high involvement categories such as cars and insurance but now also for traditionally low involvement categories such as grocery products. In this it reflects a model of consumer decision making not dissimilar to the ‘rational man’ of classic economics. Here we all act “rationally and with complete knowledge, but entirely out of self-interest and the quest to maximize personal utility”. In direct contradiction to this behavioural science has recently suggested that our decision making is largely irrational. That we are guided more by instinctive choices, emotions and mental shortcuts than by the in-depth evaluation of facts, even though we may see ourselves as making well considered decisions. Richard Thaler’s Nudge, Dan Ariely’s Predictable Irrationality and Nobel Prize winner Daniel Kahneman’s Thinking, Fast and Slow have presented a body of evidence to say we tend to make most of our decisions – to use Ariely’s analogy – like Homer Simpson rather than Star Trek’s Spock. As Kahneman explains it, we tend to rely far more on our primitive, System 1 brain that processes things quickly and instinctively rather than our System 2 brain which undertakes slower, logical evaluations, but tends to be ‘lazy’ and easily lead by System 1 thinking. A day to day example of this is how we tend to assess people based on first impressions. Research has found job interviewers tend to subconsciously form their opinions about candidates within the first few minutes (sometimes seconds) of meeting them often on the basis of on nothing more than how they look, dress, sound or shake hands. They then spend the rest of the interview selectively filtering the candidate’s responses to questions to find ‘evidence’ to back up their original feelings. 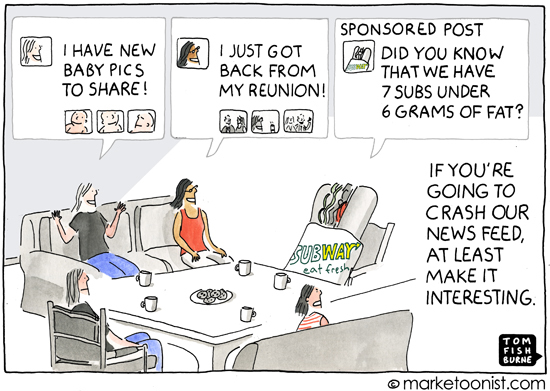 Transposed onto marketing this suggests that much of what brands are generating to influence various points of the consumer journey may just be fodder for an already made decision. A decision most likely based on something that set off an instinctive response. While having the facts available at different touchpoints to help validate the decision is necessary, the game is about mastering the irrational trigger or emotional connection in the one or two moments that really matter. The challenge and opportunity going forward is to balance technological possibilities with new psychological insight. Some brands are already doing this, some explicitly and some more subtly. The more obvious efforts involve creating content and experiences that people enjoy, find inspiring, stimulating or exceptionally helpful, and that they ultimately want to share. The current holy grail of digital marketing – the viral video – is rarely an information piece. But it can be argued that the vast majority of brands are not operating in this space. Instead they’re simply adding to, and blending into, the 2.5 quintillion bytes of data that was estimated to have been produced on the internet everyday in 2012. As the amount of information produced continues to escalate, and more technology options become available, it will be even more important for brands to have a real understanding of how people go about – or could go about – making choices in their particular categories.